The author of Games and Mathematics discusses how he came to recognize the fascinating relationship between the games we play and the math they're built on. It’s strange how apparently unconnected events can link together. When I was a small child I enjoyed playing all sorts of games. My father taught me chess when I was six, and we also played drafts and Scrabble and card games like Canasta and simple snap. I even invented board games to play with my younger brother and sister. When I was about ten, my father liked one of my games so much that he sent it to Waddington, the largest British board game manufacturer. They rejected it, of course, but I was not upset. Rather, I felt it was a feather in my cap. At the same time, I was always good at school at arithmetic and then mathematics, I suppose because it came easily to me. Success is a great motivator. It never occurred to me at that time that there might be any connection between the games I enjoy playing and the mathematics we did at school. Later, I became British under-21 chess champion, the result of some talent and a lot of hard work, and after giving up playing chess seriously I took up the Oriental game of Go and became quite good at that too – but still made no connection to mathematics. 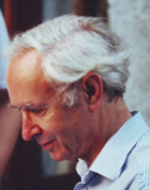 It was only when I became a mathematics teacher and simultaneously developed an interest in philosophy that I began to see connections, as well, of course, as differences. Mathematics and abstract games are not the same, they are not identical, far from it. There are similarities, and there are obvious differences. Professional mathematicians seem to react instantly by focusing on the differences. One of the curious features of the book has been the number of professionals whose initial reaction is that there is no connection – that the very idea is absurd – a sheer fantasy – but then, in one case after many, many, many emails, they come round to the view that, perhaps, yes, maybe there are some links after all. In contrast, many non-mathematicians have no difficulty in seeing that the very elementary maths that they learnt at school, including both algebra and geometry, is a bit like a game, an idea that several philosophers have had in the past but never taken seriously. I do take it seriously, as I explain in the book, but the connections are also fun and intriguing, as I hope readers will agree. I would also like to think that the comparison can be helpful to pupils in schools. Algebra and geometry are notoriously difficult for many teenagers. The idea that, for example, algebra is not merely a set of routines to be memorised, but is rather a game in which the player has a large choice of moves that could be made, and many tactics and strategies that can be used, could be a very helpful and very motivating picture for many pupils – but that is a project that I’m working on at the moment, and for the future. In the meantime, I hope that readers will enjoy the argument and the beautiful examples of mathematics that I have used as illustrations. In the long run, that is the punchline: mathematics and games like chess and Go are all extremely beautiful. Why else would they have so many devotees? Check back in for more about Games and Mathematics on “Into the Intro,” and test your gaming and mathematical skills by solving this puzzle from the book. 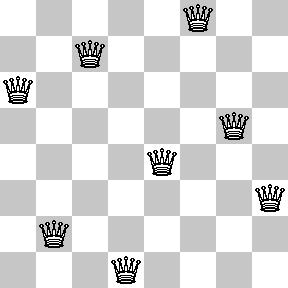 The Eight Queens puzzle: how can eight chess queens be placed on a chessboard so that no queen attacks another? Think you’ve solved it? Scroll down for a solution. This solution looks simple, easy and elegant – but don’t be fooled. There are exactly 96 solutions in total, reducing to 12 if solutions which can be rotated or reflected into each other are counted as one! Example from David Wells’ Games and Mathematics.